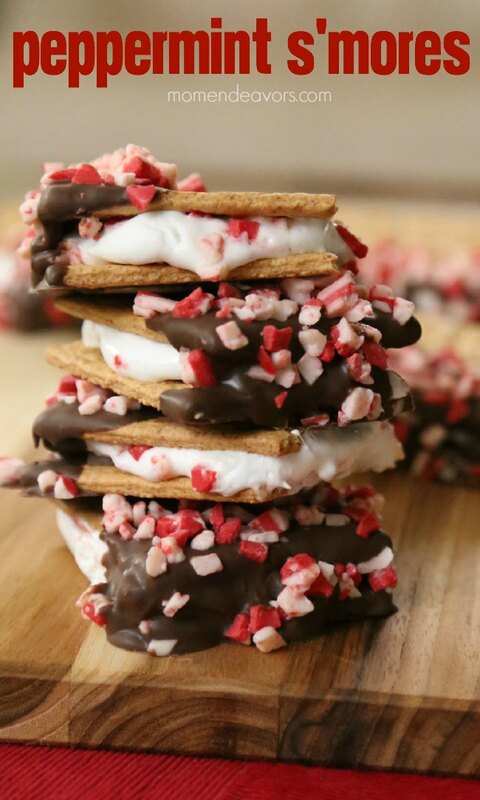 These chocolate-dipped peppermint s'mores are perfect for the holiday season! On a cookie sheet lined with a silpat or parchment paper, place graham cracker squares. Quickly dip marshmallow in water, then roll in baking chips and place on graham cracker. (If the baking chips don't stick well, then just use your fingers to pat some on the marshmallow and on the graham cracker). Repeat until every graham cracker on the pan has peppermint marshmallows. Place in oven just long enough for the marshmallows to start to melt (this won't take long -just a couple minutes). While marshmallows are in the oven, quickly prepare the rest of the graham cracker squares with two small pieces of chocolate bar. Remove marshmallows from the oven and carefully place the marshmallow side on to the chocolate graham square (I like to carefully squish it down to make sure everything sticks nicely). For added pizzazz, dip the cooled s'mores in melted chocolate and sprinkle with more of the peppermint baking chips. Allow the chocolate to set, then serve!